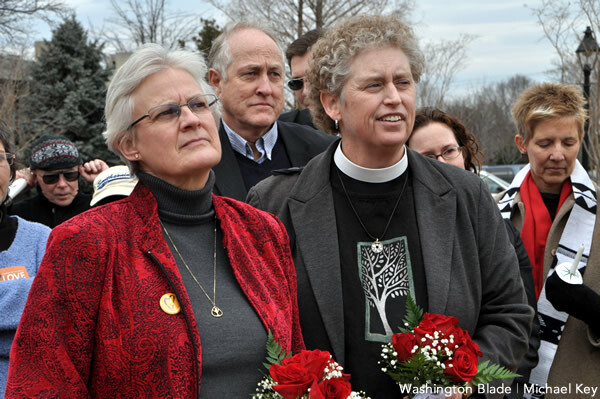 The Unitarian Universalist Congregation of Fairfax (UUCF) and People of Faith for Northern Virginia held a rally for marriage equality at Fairfax County Courthouse on Tuesday. Speakers included Mary Katherine Morn from UUCF, Rev. Amanda Poppei of the Washington Ethical Society and the President of the Unitarian Universalist Association Rev. Peter Morales. Over 250 people attended the “Project Valentine’s Day” rally. Retired Navy veterans Kären Rasmussen and Barb Brehm, who have been partners for 26 years, applied for a marriage license at the courthouse but were denied, as is consistent with current Virginia law.